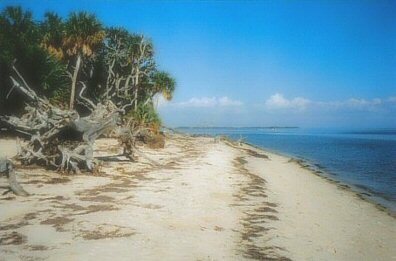 These were all scanned from photographs of Cedar Key, circa 1997. My late husband made most of them and I scanned the photographs into my computer. Although some of the buildings have had face lifts or been painted, the town still looks very much the same now. Furthermore, I think these photos, despite their imperfections, managed to capture the light and color of the town (which remain unchanged, despite surface tweakings). This little building is still there, but last time I saw it it wasn't an ice cream stand anymore. I was sad that it had been repainted. 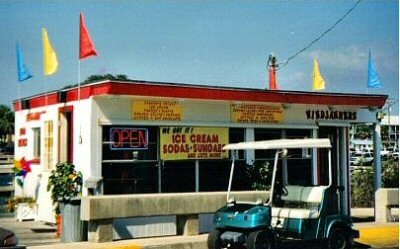 This restaurant is still there and is still a great place to have a meal while sitting right over the Gulf. 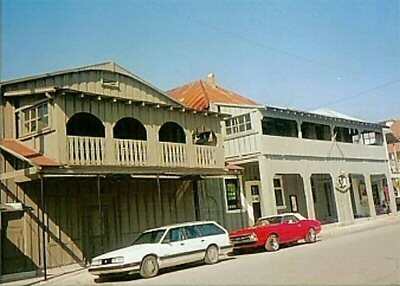 A scene from Cedar Key's Main Street. Despite the (very cool) old cars, it was actually only 10 years ago! Here are two lovely photographs (well, I think they are lovely) of Cedar Key just around twilight. The first is looking due east, with the sunset behind. It's a bit dim, but I love the soft bluish lavender of the sky and that peculiar bright blue of the water that I associate with just those few moments before nightfall. It's just some houses/hotels and a few pontoon boats, but aren't the colors beautiful? It was taken facing east with the sunset behind. You can see the reflection of the orange tints reflected in the house and the rocks. I was trying to get more of a sense than I did of the waterfront town---visible around the bend---but I ended up liking this photograph just because it really gave me that "sunset on the Gulf" feeling, when the moments seem to rush by so fast. Once the sun reaches a certain point on the horizon, it just seems to sink into the water. 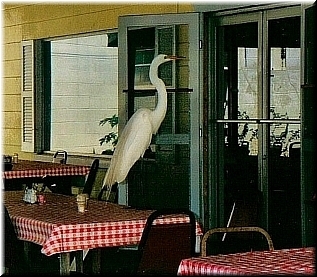 Cedar Key, circa 1997---the restaurant bird. One thing about Florida, the wildlife is quite likely to walk up and bang on your door. Is this guy not beautiful, though? I expect the owner of this restaurant---which I BELIEVE was closed that day---was in the habit of feeding him. When I was living down in the Orlando area, there were some enormous blue herons that walked around our apartment complex with absolutely no fear of man or beast. One fateful day, my stepdaughter gave them a bit of her sandwich. After that they used to bang on the front door with their beaks and squawk till we came out and gave them bread. They seemed to know when we were home. Their squawking sounded like 20 giant metal platters clattering down onto a stone floor. If anyone doesn't believe that birds are the descendants of dinosaurs, they need to spend some time around Florida's big birds. Again, though, is this not a majestic creature? Don't you wish you could reach right through the photograph and give him some food? I know I do. 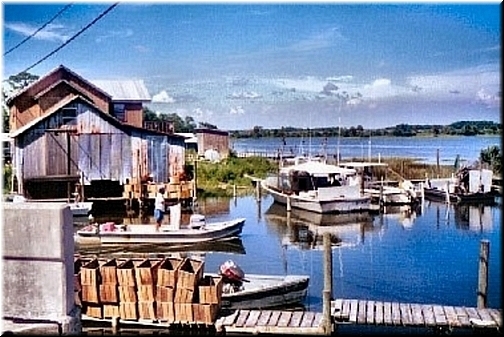 Purple clouds---afternoon in Cedar Key circa 1995. My late husband Don, who died at the end of 2000, snapped this photograph one afternoon as we were walking round the town. This was one of his favorite photographs and I've always loved it. It shows Cedar Key for what it is---slightly untidy, rusty in places, but incapable of being anything but beautiful. 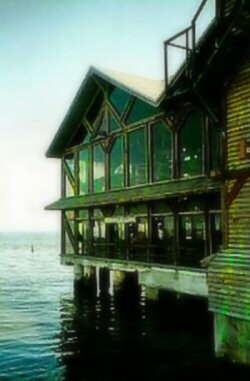 I've put off writing about Cedar Key or posting many pictures from Cedar Key because---I now realize it---I am afraid of saying either too much or too little about this little North Florida nature coast town. 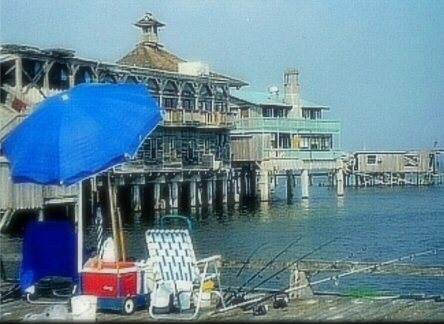 Cedar Key is a quiet island community nestled among many tiny keys on the Gulf Coast of Florida. Long admired for its natural beauty and abundant supply of seafood, it is a tranquil village, rich with the almost forgotten history of old Florida. When I take visitors around the island, they either get it or they don't. Don got it; Rumcove got it; Frannie got it; and Nick gets it. It's almost a test for me, whether or not people feel the charm of this little island town. Walking around the main part of the town, you see an authentic remnant of Old Florida in all its chaotic disorder and mysterious beauty. The same scene that looks starkly unattractive in the perpendicular noon light is suffused with mysterious radiance in the early light of dawn or right before the Gulf Cost sunset---an image of which you can see at the top of this page. 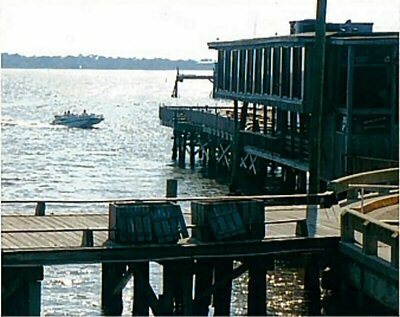 This is the Cedar Key waterfront as it looked at one point not too long time ago. It looks different in all my photographs of it, of which I have many. I think Nick may have taken this one, making it circa 2001. I like the blue and the red against the---in this photo---bronzy/greeny/weathered waterfront buildings. 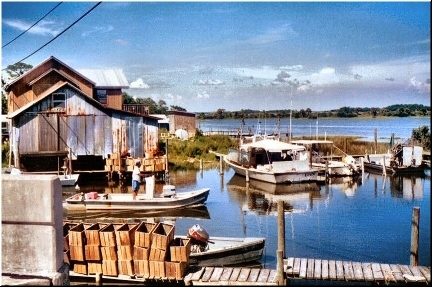 Cedar Key is a town of seafood restaurants, artists, fishermen (male and female, naturally), and pelicans. It's on the Gulf. In the town, the water is normally a silvery grey-green, not the radiant bluegreen that you see further down the coast. But if you take a boat out to any of the nearby keys---and you can rent one right there in the town---you see the authentic Gulf Coast color. This picture was taken one December afternoon; and I used it as my Christmas card photo. "Florida white Christmas" I called it. 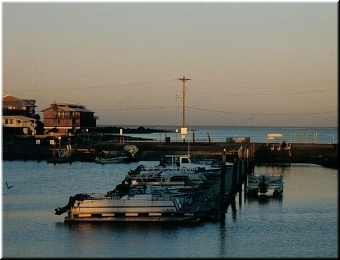 In the enlarged version of this photograph, you can see the town in the background. For me, the town of Cedar Key is irrefutable proof of the existence of God. Furthermore, I'd feel just the same if---God forbid---it suffered the fate of New Orleans or Biloxi. 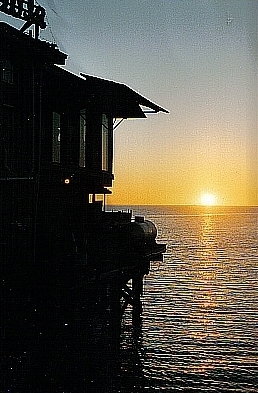 Don took this photograph of the sun setting over the Gulf of Mexico just before Christmas 1997. We had just had dinner at the wonderful Cedar Key restaurant, the Captain's Table (one of my favorite restaurants on earth), and when we walked outside, this is what we saw.Cedar Key was Don's favorite place to photograph. We took a lot of pictures there. We especially liked taking pictures in winter because---a few years ago---the winter weather was reliably clear, the light has a special clarity you don't see in our humid summers, and the sun set came early so we didn't have to wait around forever to get the late afternoon/early evening light that we both preferred. This is another photograph that really captures my idea of the colors of a Florida sunset. I realize that sunsets everywhere are much of a muchness, but the ones here have less of the bloody reds I was used to in North Carolina and more shades of coral, apricot, and peach color. There is something delicate and slightly washed out about them that I really love.